After working on Darrow and Ione's Halloween costumes and Trunk or Treat decorations, Cameron told me "You know, you can't post that online. Your Pinstrosity people will hate you. You can't be one of the Pinterest Moms" And I got a little offended by his comment. But I knew it wasn't meant harshly, and it wasn't worth getting worked up, so I brushed it off. Then last night after laughing over the results of Darrow's birthday cake (he requested a black cake) he said, "You can show this one!" I wasn't offended this time, but it did make me stop short. 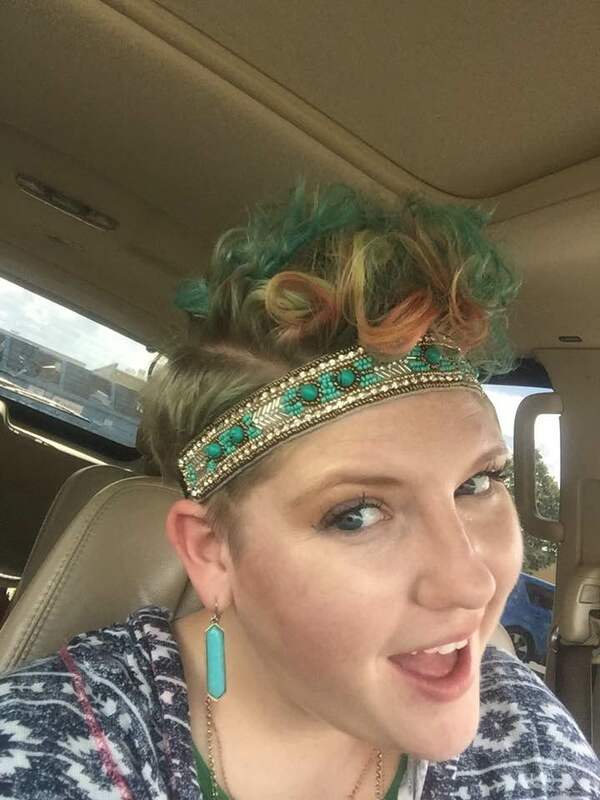 Can we talk about "that Pinterest Mom" for just a minute? You know her. The woman who just blew up your feed with the pictures of her perfectly executed themed birthday party fit for a rock star. Or she's the woman who is always posting pictures of the cute and educational things she is doing with her children. Or she's the woman who is posting about her kids quietly playing in their room while she does her hour of yoga and meditation. Or she's the woman who always looks on point and gorgeous. Or she's the woman who always has the cutest date night pictures of her and her "bae" (really...where did that come from?!) and their cute and perfect relationship. See, you do know her. We all know her. Or a few "hers". And for some reason so many of us feel threatened by her. Enough so that "Pinterest Mom" is becoming a derogatory term. Now I know that there are some exceptions, but really for the most part, I don't think these "Pinterest Moms" are out there doing their thing to make any of us feel bad. That's not their point at all. And you know what...none of them have it all 100% together. I know I don't. I know that none of the amazing women that I know have it all together. Some have it more together than others, but none of us are spotless and we all are hot messes in various aspects in our lives. But we compare our hot messes with our other's shining successes all too often. Of course there is going to be a disparity in that comparison! We have to stop it. Stop the comparison. Stop the "Pinterest Mom" shaming. Her success is not my failure. Say it with me. Her success is not my failure. We each have strengths. Every single one of us. We also all have thing we're not so good at. 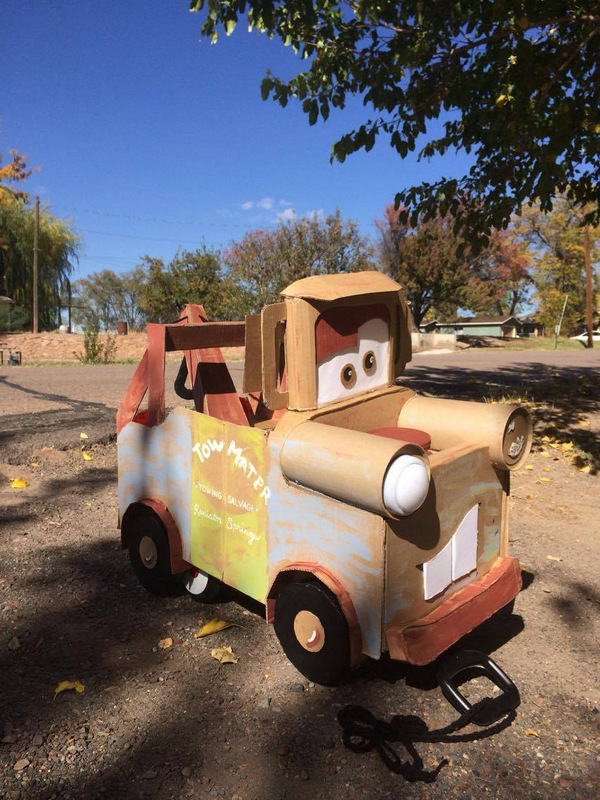 I make a mean cardboard Mater, but can't make a pretty cake. I take my family out on day trips, but I really dislike sitting and reading stories to my kids. I love making bouquets and wall hangings, but I can't keep my house clean ever. Would I like my weak points to be stronger? Of course! But just because I am a crappy housewife, doesn't mean that now I can't buoy up and cheer on those that are fabulous at that. "Real" is such a buzzword right now. I love the movement of showing real life and not putting up a fake front, but don't get so enamored with real that you forget that talents are real too. It's okay to be a Pinterest Mom. It's okay to not be a Pinterest Mom. We all have our differing abilities! If you find yourself putting anyone down for something they did well...stop. Stop immediately, and find a sincere compliment you can give. Even if you were just putting them down in your head, stop, and tell your Facebook friend that you love how happy her kid looks at her party, or how beautiful the quilling was on the card she just made, or how fun the sign is that she holding at her child's game, or that you are so glad they get to go on date nights. Be sincere. And soon you'll find that your outlook will change, your mindset will morph, and you will be happier! We can do this! We can lift each other up instead of tearing each other (and ourselves) down! Last night was a double Pinstrosity night at our house. Let me set the scene for you. After a week on the road I'd collected quite the excess of water weight and car munchy flub. So I was determined that this week I'd get back on track and eat right, starting with a few days off of carbs to get my carb addiction curbed a little. The kids and I went to the grocery store, stuck to the grocery list, and I didn't even take a "Mommy tax" bite of Darrow's maple glazed donut. I was going to rock this. All day I was good. No sneaking treats, keeping up on my water, eating small meals every 3 hours. I had it down. Even when my salad for lunch was just ho hum, I stayed strong because I had a plan for dinner that was going to rock. 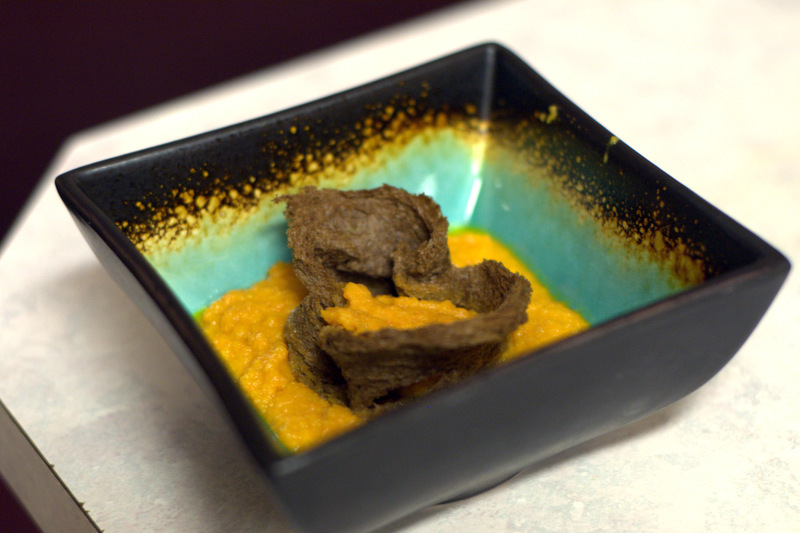 Eggplant Parmesan and Curried Carrot Soup. Two of our favorites, both from Pinterest! Everything went great until I pulled out the ingredients to start making dinner and realized I'd have to improvise a little. There was only 1/3 c. of parmesan cheese left. But I'd already sliced the Eggplant and had the eggs beaten, so I was committed. Running to get more from the store would be a 20 minute venture and we were hungry now...so I decided to just run with it and make it work. I only coated one side of the eggplant in parmesan, but still only got 2/3 of the way through before I ran out. So I just seasoned the rest with garlic powder, onion powder, and Caribbean Jerk seasoning and popped them in the oven. It was then time to get the soup going. I sauteed the onions without burning them and knew this was going to shape up to be something tasty and filling. I'd been looking forward to this all day. Just as it was time to add the final ingredients for the soup, the timer dinged that the eggplant was done. All I had left to add to the soup was the cayenne pepper, so I figured I'd throw that in really quick and then grab the eggplant. And that was my mistake. In my hurry to just get the cayenne in I figured I'd eyeball it rather than pull out a measuring spoon. So I opened the cap and went to add a few shakes of cayenne and realized that unlike most of my spice canisters, this one didn't have the handy little shaker/filter top. It was just open. So in dumped about 1/3 of my cayenne pepper container...which was about 20 times the amount the recipe called for. I quickly grabbed a spoon and went to scoop out the cayenne to see if I could salvage it. Cayenne dissolves FAST! I couldn't get it out. So I stirred it all in and then drained off 3/4 of the liquid and added the last of my chicken broth in, adding a little water to make it stretch some. And then I realized I hadn't pulled the eggplant out! Eek! Last time I left it in too long it was gross and burned bad. But this time...with the lack of Parmesan, they were just kinda slimy and meh. But I flipped them and added sauce anyway. Maybe they'd still crisp up. Maybe. I finished making everything, got it served up and we went to dig in. I'd been waiting for this all day. And then nearly burned my throat off. I muscled down a few spoonfuls of soup before I stopped. I like spicy food, but the only thing I could taste was the cayenne and the heat. Pushed that aside. The eggplant parmesan was edible, but just meh. Without the Parmesan to soak up the excess moisture and crisp up, they were just kinda mushy and weird. I downed the rest of my water for the day, cleaned up dinner, and then Cameron and I sat and ate Peanut Butter M&M's while playing board games because so far I haven't found a way to mess up the system of opening the bag and getting that orb of peanut butter goodness in me. Wait...yes I have. That one time I was opening a bag in the movie theater trying to be quiet and the bag ripped down the sides and M&M's went flying everywhere and you could hear them rolling down the slanted floor and hitting the wall/screen in front. Yeah, you can Pinstrositize anything. Or at least I can, bahahaha! Remember the hair trend where you do no heat curls overnight?? We wrote several pieces about this disaster, you can find those here, here, here, or here . Apparently it's been long enough since we featured those that I had forgotten the catastrophes at hand...because this was my thought process. 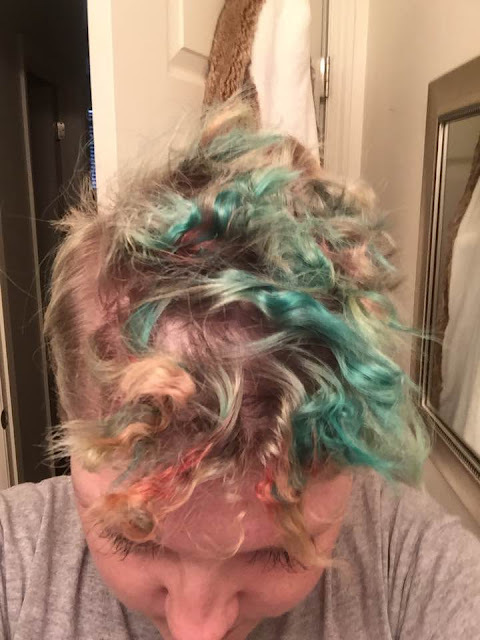 "I should do cute curls in my hair, yeah, that would be cute! Like little ringlets. But I don't want to curl it in the morning, so I'll just do like rag curls tonight while its wet and I pull them out in the morning and they'll be great! Sweet, I think I have some pipe cleaners! Let's do this!" Mind you, I have a pixie cut. And it's only kind of long enough to do stuff on top. I used two pipe cleaners and just wrapped my hair around them as I weaved it zigzag in the top of my head. I didn't feel it at all when I was asleep so it was pretty comfortable. The next morning I pulled them out. Not good. Really not good. Pinstrosity to be sure. I actually looked better with the pipe cleaners in it! This was straight up medusa! It was fuzzy and there was no rhyme or reason to the curls, just a jagged mess. And of course I didn't leave myself lots of time to make it look nice, so then I'm scrambling to make this workable. I caved. I pulled out my tiny flat iron and basically curled the whole thing all over again. It was actually more work to fix it then it would have been to just curl it in the morning in the first place. So much for saving time eh?? Also, it was already sticking straight up, so we just had to go with that. I think it ended up having a Ducky from Pretty in Pink feel to it. Not awful, but I'll admit I got a few looks lol It's not the most popular style on the market, but I could do worse! Here it is after I fixed it! Zero-to-hero in a lot of time and unnecessary hair grief because I saw something like this with long hair on Pinterest once. So there it is. It was a mess two and three years ago, and its still a mess today. So much for being a professional hairdresser and knowing what I'm doing here lol Anyone do this style regularly?? Have any secrets to share!! Let us know!! Traditions are some of my favorite things to learn about. I love knowing what people do, and why. I love seeing the bits of heart put into things, and how these traditions bring people together. When we were first married traditions seemed hard. We hadn't been married long enough to have any traditions together. 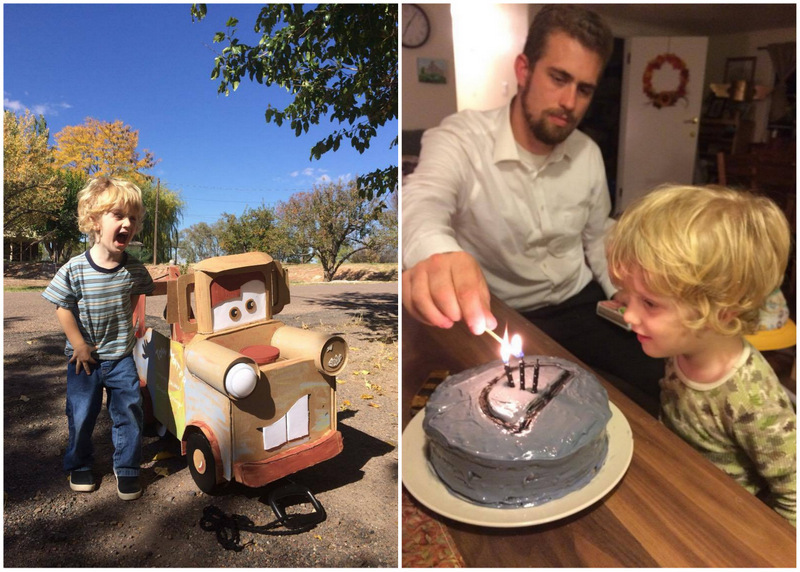 We borrowed traditions from growing up and from what we saw people doing, and tried them out. Some we loved. Some didn't work. 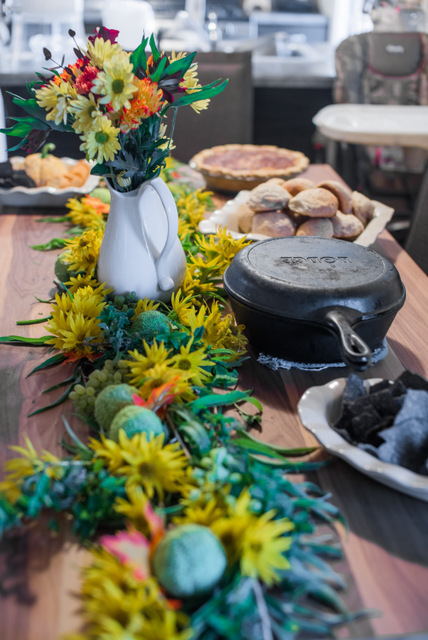 But one tradition that has stuck around, and that may be one of our favorite traditions now, is our annual Autumnal Equinox Dinner. This dinner tradition started as a spin-off of a tradition Cameron's family had. On the Winter Solstice, the Mowers would all get dressed up in their Sunday best and come together for a traditional Christmas meal, as Christmas day they had the traditional New Mexican feast. For the solstice they'd have ham, potatoes, and the whole works. We wanted to carry this on, but as students we weren't likely to be home for the Solstice each year and we wanted this to be a tradition we could do at our house. So we chose the Autumnal Equinox, because it's smack in the middle of the semester and we knew we'd be home the new couple of years and could do this as something special for us. 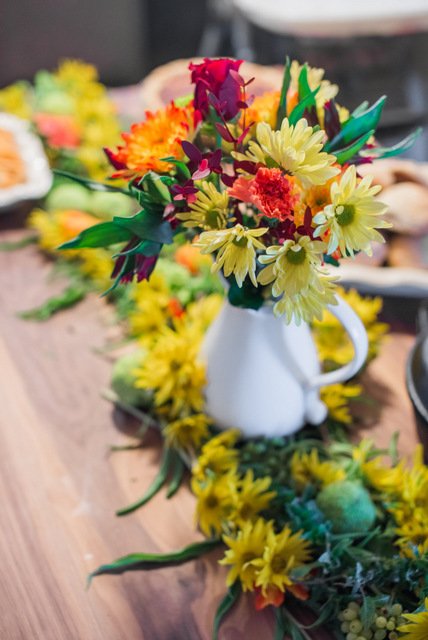 A few weeks ago we had our 6th Annual Autumnal Equinox Dinner. Last year it fell on Day 2 of the Keeping Up Appearances challenge and I definitely bit off more than I could chew. So this year we tried to keep it a little more simple with the food prep. No crazy melted cake this year! We ended up with some super yummy parts of the meal, some meh parts, but somehow thankfully no Pinstrosities other than me not starting food prep early enough and us starting about 40 minutes later than planned. But that's doable. Instead of getting the whole meal from Pinterest this year, I decided to mix and match. I turned to our favorite cookbook for the chicken, because every single recipe we try out of the America's Test Kitchen cookbook (with every recipe they've tried from 2001-2014) turns out phenomenal. We've never had anything not turn out. Well, except the time I forgot to make the sauce. That time the meal was meh...but that was my fault. I trust that book over anything I find on Pinterest. But, I can't throw a party without Pinterest being involved somehow of course! This one is a double win! 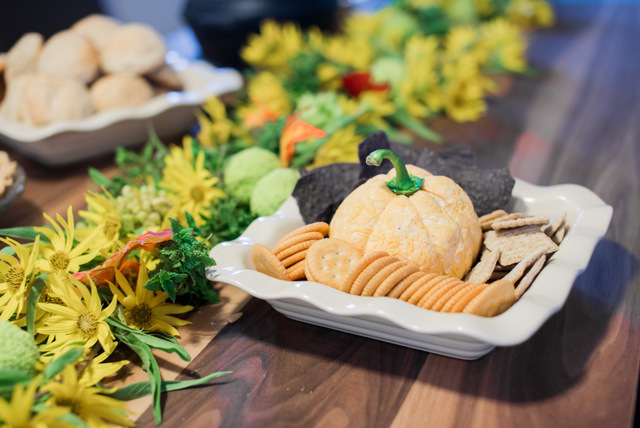 While looking for cheese ball ideas (because that in and of itself is becoming an Autumnal Equinox Dinner tradition), I came across a pin for a pumpkin shaped cheese ball. I was sold. I made the cheese ball from this recipe and tasted it. Super salty and intense! So I added another block of cream cheese, and then threw in more grated cheese to get a better consistency. After that it was just right. I rolled it in finely grated cheddar cheese to get the orange color on the outside and because there were nut allergies in our guests. Then it came time to shape it. 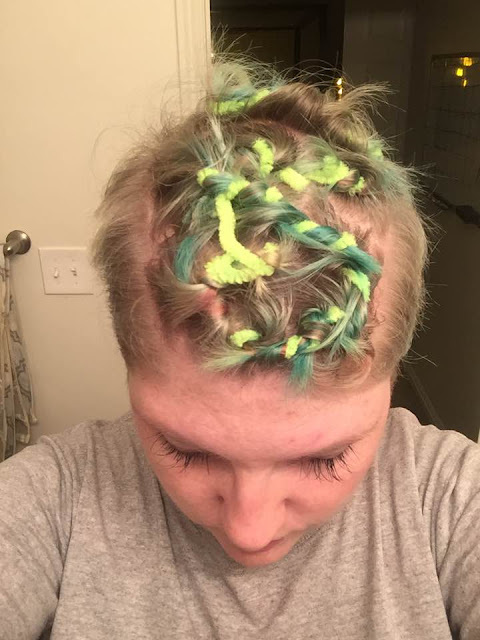 I didn't have rubber bands on hand, but I did have yarn. So I cut three lengths of yarn, and then used each one to tie around the plastic wrapped cheese ball, tying it tight enough that it cut into the cheese to create the divot. When it came time to put the platter together I cut the yarn, took the cheese ball out of the plastic wrap, added in the stem from a bell pepper, and it was ready! This one was fun because it looks fancy, but is super easy. Our friends thought at first that I'd molded it or spent a long time getting the shape right. So A+ for this pin!! And by the time this got put together and out to serve, the party was in full swing and my camera was safely stowed away from the kids. But, it looked just like the pictures in the original link. And we "dirtied" it up redneck style with Almond Joy creamer (our grocery store here didn't have plain coconut cream creamer, so we went with the Almond Joy, and that touch of chocolate flavor was yummy)! And the Pinterest Meh: The Snickerdoodle Pie. I was pretty excited about this one. Super excited. Which maybe is why it ended up meh, because I had it built up so much in my head. I even did a series of pigs running around the outside for the crust (because naturally I have a pig cookie cutter, but nothing remotely fall-ish likes leaves or anything). First thing that went weird was the amount of filling. It didn't even fill the crust half way. 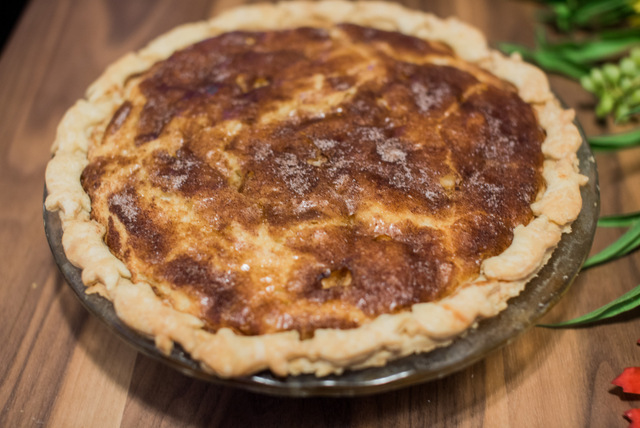 I made a deep dish pie (as always), but normally even regular pie recipes come up higher than that on my deep dishes. I reread the recipe and the comments and it didn't say anything about it puffing up or anything, so I decided to make another batch of the filling to get it to the top of the pie. And in the oven it went. But of course because there was double the filling, it took much longer to bake. But the crust didn't burn (wrapped it in foil), and it smelled and looked delicious. Anticipation was high! Dinner got over and it was time to cut into the pie (and just now as I am sitting here typing this I realize that I completely spaced getting the whipped cream out for it!). I cut the first slice, pulled it out and it was a pake! For anyone who's not a Drop Dead Diva fan, that's a pie and a cake combined. The filling was cake basically. It didn't taste bad, but it was just kinda meh, and a bit of an odd consistency. I think I was expecting more of a baked custard pie for some reason. No one disliked it, but it looked yummier than it ended up being sadly. So I might try tweaking it a little and seeing if I can't come up with my own snickerdoodle pie that's more what we were expecting. We'll see. But altogether it was a fabulous meal! The "rule" (or tradition might be a less harsh way to put it), is that the fall decor doesn't come out until the day of the Equinox dinner. It was fun to pull out my wreath, garlands, and table runner again! But then I got an idea and before everyone came Cameron and I ran around the yard and the empty lot across the wash from us and gathered bits of nature for a tablescape. We cut down some of the sunflower stalks to make a table garland for the center. 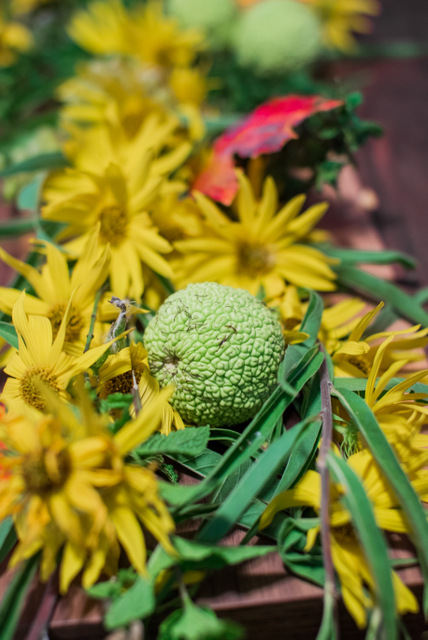 Cameron also found an Osage Orange tree (also known as a hedge apple) and we picked a few to go into the decor (because I think they look so funky and cool! Topping it all off was the gorgeous autumn bouquet my friend Wendy brought. The colors were perfect! It's still on my kitchen table and other than a few flowers we've had to pull out, it's doing beautifully! Overall, each portion of the meal and the evening was simple, but when combined all together it was such a nice evening and a yummy meal! We loved the time we had to visit with our friends and celebrate the goodness of life. I can't wait for next year's dinner already! What is your favorite tradition? How'd it come about? Some of you may have noticed that Prickly Pear Week came to an abrupt stop with no explanation. Well, it turned into a Pinstrosity of it's own. Without going into details (because you don't want them)...I forgot one important thing about Prickly Pear fruit. They are very high in fiber. And I totally didn't think of that when I was putting the prickly pear juice in everything we ate that week (morning smoothies, lemonade, cupcakes, waffles, marinades, etc). So for the sake of our internal systems, it had to stop immediately. But I did want to share one recipe with you that we came up with that we LOVE! 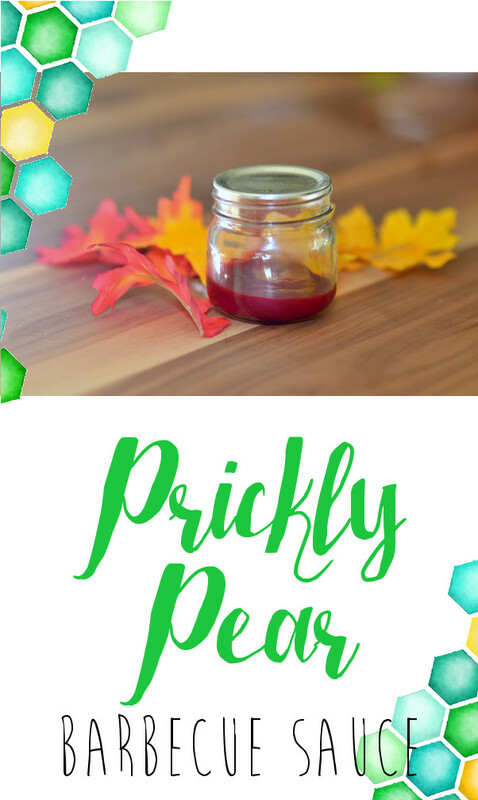 Prickly Pear Barbecue Sauce! That's not all it makes...that's just what's left and only because I had to save some to take a picture of. This sauce is tangy, slightly sweet, and has an amazing flavor and color! After reading a number of barbecue sauce recipes, we combined tactics on some, used a regular barbecue recipe as our base, and then jumped in! Mix all ingredients together in a medium saucepan until combined. Bring the mixture to a simmer, whisking until smooth. Store in a sealed, glass jar in the refrigerator for 2-3 weeks. It's been one year since we relaunched the blog. One year since the rebrand. One year since our "Keeping Up Appearances" Project. One year with the new Pinstrosity! Last week, which was supposed to be my week for posting on the blog and Instagram, I took a "sabbatical". It was the opposite of the Keeping Up Appearances project. I wasn't trying to show how ridiculous it is to try to live up to social media standards (the point of the KUA project), instead I was forcing myself to take a step back from it all because in the months following the KUA project I got sucked back into the "I can do it! I can live an Instagram/Pinterest/Facebook perfect life! And if not, I obviously don't have anything worth sharing."vortex. It wasn't consciously. It definitely wasn't on purpose. But when I realized what was going on it felt like I'd been sucker punched. I wasn't even living up to our own "preaching". 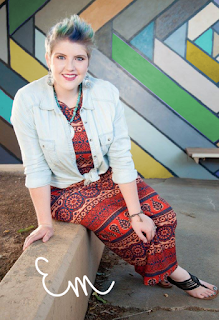 I'd meandered away from "Life isn't Pinterest Perfect, and neither are we!" mantra. This collage of photos pretty much sums up a large portion of my life. If I had a picture of one of them crying to put in the collage, it might have made it more real life. I love these people and I truly do love the life we are building. But it isn't all pretty days and happy trails. And often when things are smack in the middle of diapers, grocery runs, bills, keeping the kids fed, getting people to sleep, and building a business, it is hard to look at it all and feel like there's anything to share (because as cute as I think my kids are, I'm pretty sure you all don't need or want daily doses of my children and their pretty normal antics ). It gets easy to see all the very non-glamorous parts of life and feel like that's all there is. So then hopping on social media and you see everyone else's best 5% of life that gets posted, it's hard to remember that they are sloughing through the mundane parts of life too. It gets hard to feel like what you're doing is going anywhere. So I took a week off. Well, sorta. It ended up being a crazy week, but I didn't blog. I didn't post on Instagram. I didn't post on Facebook (well, beyond a few groups I'm in when I needed to ask a question). I didn't plan posts or blogs. I just lived. And it was great. The week took me all over the state, and gave me a lot to think about. Directions I want to go with my online posts. Messages I want to rally behind. Things I want to incorporate into my life. Stories I want to share with you all. I follow a great account on Instagram called A Home Made for Hosting. This account follows the home building dream and story of a photographer husband and wife team I follow. She just did a blog post about fear of showing their house online because they are afraid that people will judge their house. This home is beautiful, and will end up being a huge blessing to so many people (they are incredibly giving and have serving hearts, and have designed their house so that they can use it to bless others). But without knowing the heart and the why, some people may send nasty-grams their way about it (which really is ridiculous that people do that). I feel much the same way, only on the opposite side of the spectrum. I feel fear about posting about my life because too often I tell myself that I don't have the experience I need to have a voice. I fear that people will look at my life and dismiss this "redneck" girl from the sticks. I fear that I don't really have anything to share, and that everyone feels that way too. But, as this same photographer stated, fear is the opposite of faith. Fear holds back. Fear restrains. And in this case, I'm using fear as a pity party. I'm using fear to tell myself that I don't have anything worth sharing. We did the Keeping Up Appearances project to show just how ridiculous it is to try to live a "perfect" life. We didn't realize the opposite end of the spectrum though. 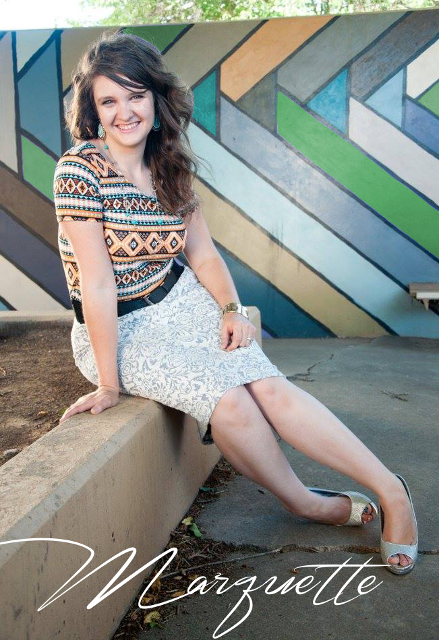 The Keeping Up Appearances project wasn't just to say "We can't do it all, and that's okay!" but it also was to say, "Our lives have worth and meaning, even when they are not 'perfect' or dazzling!" This past week wasn't "beautiful" as far as imagery goes. But it was exactly what I needed. It gave me perspective. It gave me time. And it gave me motivation. I didn't get ahead on blog posts in the least bit. I didn't plan out social media posts. I didn't keep a perfect house, make amazing meals, or try new make up. But I did spend more time with my kids. We just got done with an at home game night date night. I finished an audio book. Skeins of yarn were actually used. And the neighbors got to witness the crazy lady running around the yard in her pajamas at 6:30 in the morning because there was fog outside and it had to be documented accordingly (fog in AZ is not a common thing). And sitting here typing all of this I'm realizing that even with all the craziness that was last week (16+ hours in the car for eye appointments, hair appointments, grocery runs, etc), I wouldn't trade it for a week full of "social media worthy" activities or life. I lived life not worrying about how to blog what I was doing, or how I could show it on Instagram in a way that would fit into my feed aesthetics, or worrying about what people would think if I showed my life. I lived. I put myself back into my life, and it was glorious. This past week reminded me about life, about family, and really about the heart of this blog and the heart of the new direction we took with it last year. Life isn't Pinterest Perfect, and it doesn't have to be Pinterest Perfect to be worth sharing about. Our lives won't resonate with everyone. It's just not possible. But through sharing our lives, our fears, our goals, our failures, our triumphs, our quirks, and our love, maybe we can find a tribe of people, our sweet Pinstrosipeeps, who might need our voice (and who's voices we'll need in return, because you guys blow us away with your love and support and we are so grateful for you! You buoy us up!). So welcome to Year 2 of the "new" Pinstrosity, in which we relearn old lessons, grow in ways we didn't expect, try new things, fail a few times, laugh a lot, cry a little (because we're girls and that's just what we do), and adjust our tail feathers. We're so glad you're here on this ride with us! Buckle up, keep your arms and legs inside the car at all times, and hold on tight, because we're not exactly sure what this ride is going to bring, but we know it's going to be worth it! 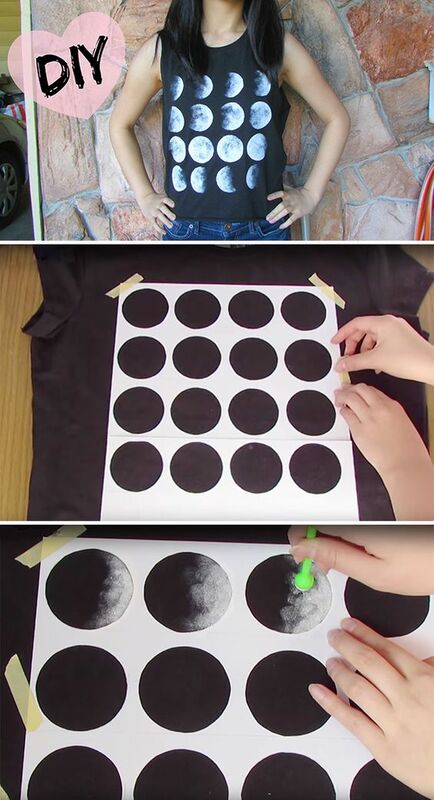 DIY Phases of the Moon Shirts! So if you haven't seen our DIY Geode Cake post, you can find that here! I mention it because while my cakes were cooking Manny (my New Mexico BFF) and I made shirts! They were quick, easy and SUPER CUTE! The whole project cost me $7.88, what?! I saw this pin a couple months ago and have been saving it for just this occasion! We had our shirts, our paint, some paper, scissors, tape, a pencil, plastic grocery bags, a circle to go off of, and little round sponge brushes. The hardest part of this project was making the circles even in terms of how far apart they were from each other. We used two pieces of paper taped together and the bottom of a glass as the stencil. We placed grocery bags inside the shirts to keep the paint from bleeding, we used straight white acrylic craft paint. After cutting out or circles we taped the stencil to the shirt and started to paint! We mostly went off of the picture, but there is a little bit of artisticness to it. It only took about 20-25 minutes in all and I seriously freaking love this shirt! We did 4 circles down, 4 circles across. At one point in my life I knew all of the phases of the moon, but that "phase" in my life has come and gone obviously (I know Marquette would know this one!) I have no idea how many phases there are, but the 4x4 method is very aesthetically pleasing, so we went with that. One thing I would suggest is to make sure you keep your paint within the parameters of your stencil or messy paint gets where it shouldn't. I missed and have two tiny white spots that aren't moon, but I just Sharpie markered over them and we're good to go. We let them dry for about 2 hours and they were ready to wear! Now we have BFF t-shirts and we are over the moon excited about them! Oh! I kid, I kid. This would be a great idea for a birthday party, craft night or quick gift. Super super easy and they look really nice! I literally have THE coolest friends. They are so good about sending me pictures that remind them of me, and most of the time they are funny and cute,but every once in a while they speak to my soul. 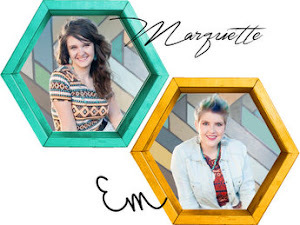 Marquette sent me a Instagram a few weeks back that was like my soul in a cake. And I just HAD to have it. Fast forward to one of my other BFF's coming to visit, and we decide that we are going to tackle said project even though it may be way over our head. We fear no fail. Fun fact of the day...I didn't even realize until right this very instant that this was a girl I went to high school with?! What?! Small world! This isn't the first first picture we saw of Geode cakes, but it pulled up when I did a search and was similar colors and super pretty, this was just an idea Marquette had seen and showed me on google when she came to visit. When I did the search of images for this blog post a few days ago, this is one of the first ones that popped up and just happens to be made by someone I know! Isn't that fantastic?! So beautiful! So I went to work, I called around town looking for gold leafing, I went to Michael's and Hobby Lobby looking for edible gold leafing and priced some of their baking tools, and I even called some places in Salt Lake. Manny my New Mexico BFF came and we got to work! We went to all our stores to pick everything up, we even went to three different stores to get all the rock candy we needed for this! As for the gold leafing...I called 5 stores and went to 3 different stores and only found ONE place that had edible gold leafing. Here's the kicker...it was $75.00 for 3 ounces!! WHAT?! So...we went with a gold luster dust and gold faux leafing alternative that we found at Hobby Lobby for about $3 a piece instead. Apparently gold leafing is really only for super fancy occasions...because at my house Thursdays just aren't good enough for $75 cake décor. We bought rock candy in light blue, dark blue, white and purple. They were SO yummy, of course we sneaked some during the process! We also had blue and white fondant, generic frosting and rainbow chip cake, and then some of the supplies for the cake itself. The fondant was probably the hardest part, we followed the directions and rolled it out, kneaded it and then we roped the two colors together to create a marbled affect when it is all rolled out. We baked the cakes beforehand and crumb coated them and then put them in the freezer so they would be easier to work with and not crumble-y. When we had the fondant where we wanted it, we pulled the cakes out of the freezer and threw it on there! Getting a smooth coat on the cake was really difficult. Did I mention this is both of our first foray's into fondant?! Because it was. We used powdered sugar to keep the fondant manageable, you can also use corn starch. Then came the really fun part, decorating! We cut out our desired geode cave shape with a small knife, and then covered it in frosting before placing our rock candy. Lastly we put our "gold leafing" on the cake and threw some luster dust on there for good measure. Here is our final result! Not too shabby for our first fondant cake EVER. It's not perfect by any means, and the more I look at it, the more I tend to find faults, but it's a cake not a Saint, so who cares if it isn't perfect?! 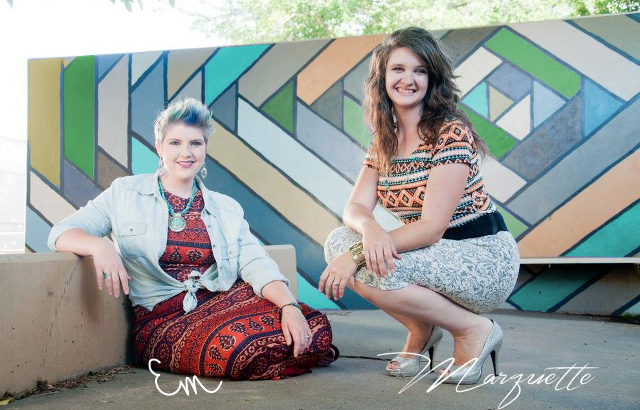 It was REALLY sweet, but it was good and it was just really fun getting to do this project with a friend! Are any of you mavericks with fondant?! What are your secrets?! Share below!